Delegates attending yesterday’s Making real time successful in the Eurozone session at Sibos 2016 heard that the key to success for banks will be to initially focus on their own domestic payments markets – which still constitute the vast majority of their payments. Augé said the European payments landscape had a long history of fragmentation and different behaviours of CSMs. However, he was optimistic, saying “the more we share, the more we collectively can address the issues”. SWIFT’s global payments initiative (gpi) was an example of what the industry could do when it worked together, he added. By sorting out domestic real time payments, banks could share their experiences with others then work together to build a pan-European infrastructure. 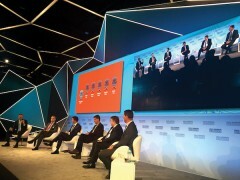 Stefano Favale, Head of Global Transaction Banking, Corporate & Investment Banking Division, Intesa Sanpaolo, said critical success factors for real time payments would include “clear and transparent rules on AML and compliance, as well as common rules around directories and other services”. He believes new regulations will also have an impact. “PSD2 will force the use of open APIs, this will also boost the use of instant payments. Hungary’s central bank and regulator, Magyar Nemzeti Bank (MNB), is bringing a new instant payments system to the country. It will require “state-of-the-art IT and communication solutions in payments”. De Volksbank has chosen equensWorldline to process its immediate payments transactions. ACI Worldwide and Vocalink have joined forces “to offer a complete end-to-end immediate payments solution to launch a domestic or regional immediate payments network”. The partnership will combine Vocalink’s Immediate Payments System (IPS) offering for central payment infrastructures and ACI’s UP Immediate Payments solution for banks and financial institutions. Real-time payments: forging path to the "new normal"
There is intense interest in instant payments (IP) throughout Europe. Domestic schemes are already live in the UK, Denmark, Poland and Sweden. The success of these schemes shows what’s possible but also teaches many lessons.